Mew & Mewtwo gain 20 HP. Discard 2 Fighting Energy cards. Flip a coin 6 times. This attack does 30 times the number of heads you got. Comments : Mew & Mewtwo happen to be friends. 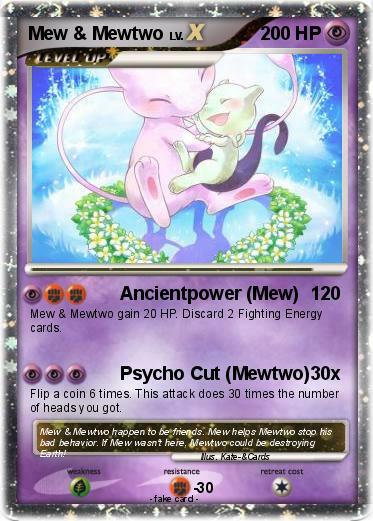 Mew helps Mewtwo stop his bad behavior. If Mew wasn't here, Mewtwo could be destroying Earth!